The weather on Saturday 11 March is better, so we will do this hike on Saturday. Meet at 7:30 am. Sunday, March 12, another hike will be planned: The mountain of Sous-Dine, 900m of elevation gain. See you at 8:00. 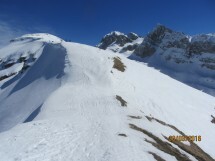 I organize a winter hike to the Tête de Bostan from Samoens (60 km from Geneva) on Sunday March 12th. Beautiful sport output. 1300 m elevation. From the parking lot, the trail winds gently down to the Col de la Golèse. From the pass, we climb the Plateau of Lagots (1800m). While the sporting group continued hiking up Bostan (2400m). A gradient of 1300 m and a distance of 14 km. Walking time: about 5 hours.